The number of so-called kruisboten was ordered to be continuously 85 units. However at the end of 1863 were just 175 against the 78 on 31 December 1862 available. Seven new ones were being build at private yards at Batavia and Dassoon (Rembang) and further more were two condemned and one wrecked to be replaced. Negotiations with a shipbuilder at Surabaya were not successful due to his financial demands which were high comparable with elsewhere. Considered the model of the used kruisboten was decided that where they were used for transport and communication-purposes the former cutter model was to be used again. In some areas was the present model lacking enough seaworthiness. 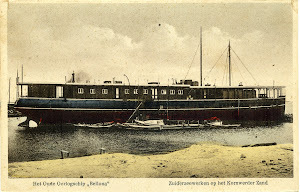 The boats built at Batavia and Dassoon between 1851 and 1863 were numbered from 1 towards 75, were armed with 3 guns and ha a crew of 20 native sailors. The total personnel strength was 1,500 natives consisting of 75 djoeragans or masters. 75 mandoers, 360 djoeroemoedies or helmsmen and 1,050 sailors. Normally it was hardly any trouble to replace missing men on board of these crews and finding crews for new commissioned boats was also not difficult. The men were mainly enlisted at Batavia. Kamerstuk Tweede Kamer 1865-1866 no. 89.2 Annual account dealing with the colonies over 1863.